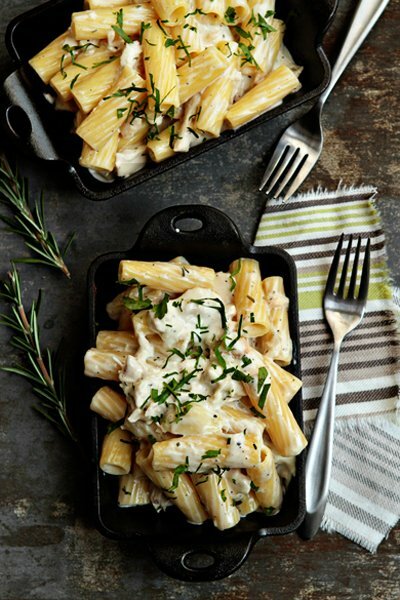 The recipe combines cream, goat cheese, garlic, chicken and rosemary into a creamy and delicious sauce. I’ve never been a big fan of mac n cheese, sorry folks, I just never liked it. Let me explain. I grew up not really liking cheese in general. I’m not sure why, but even today its not my favorite. I cannot sit and eat an entire cheese course nor do I enjoy a snack of cheese and crackers. For me, cheese needs to be in a dish or on a pizza. One of my brother’s favorite meals growing up was my mom’s macaroni and cheese, we ate it pretty often. My mom did the whole make the cheese sauce and bake it thing, it wasn’t Kraft, but I still didn’t enjoy it much. It was too bland and too much of the same flavor for me. Naturally, this twist on that dish intriqed me. The ingredients were simple and since the recipe didn’t take long to make, it looked perfect for a week night meal. To start the recipe, combine the heavy cream, garlic and rosemary in a medium sauce pan and place over medium heat until it begins to simmer. Watch so it doesn’t boil over and keep it at a low temp so that its still simmering and reduces by half. The recipe says this shouldn’t take too long, for me, it took about 40 minutes to reduce properly; plan accordingly. While the mixture is reducing, cook the pasta and shred the chicken. Once reduced, stir the goat cheese into the cream mixture until smooth and thick. Add the roasted chicken to the mixture. Combine the mixture with the cooked pasta and top with some fresh rosemary. The flavors are subtly delicious, but this dish is extremely rich. Another tip is to make only half of the recipe depending on how many people you’re feeding. It doesn’t reheat well because of the cream sauce and you never eat as much as you think because the sauce is so rich. This recipe was simple and delicious, a mac n cheese I could get used to! Place a large pot of salted water over high heat and bring to a rapid boil. Add the oil and rigatoni to the water and cook according to the directions on the package, 10-12 minutes. While you are waiting for the water to boil, pour the cream into a large sauce pan over medium heat. Add the rosemary and garlic to the cream and bring it to a simmer – take care not to let it boil over. Allow the cream to reduce by about half. Stir in the goat cheese and chicken and continue cooking cooking it till the cream coats the back of a spoon. Thoroughly drain the pasta. Add the pasta to the sauce. Coat the pasta in the sauce and simmer over low heat for a few minutes. Serve hot.